I went to a community book sale this weekend. I certainly don’t need any books, and certainly not any more cookbooks. But like a moth to a flame I was drawn to the table where all the available jewels of culinary wisdom lay in waiting. Circled several times while scanning the range of old and new publications. The first one to reach out to me was a brand new copy of “Hope’s Edge: The Next Diet for a Small Planet” by Frances and Anna Lappe, and I reached in to meet it. And even though I emerged with an inspiring small stack of findings, I knew this book would be the heart of the eclectic group…. But I’ve been working my way up to it. 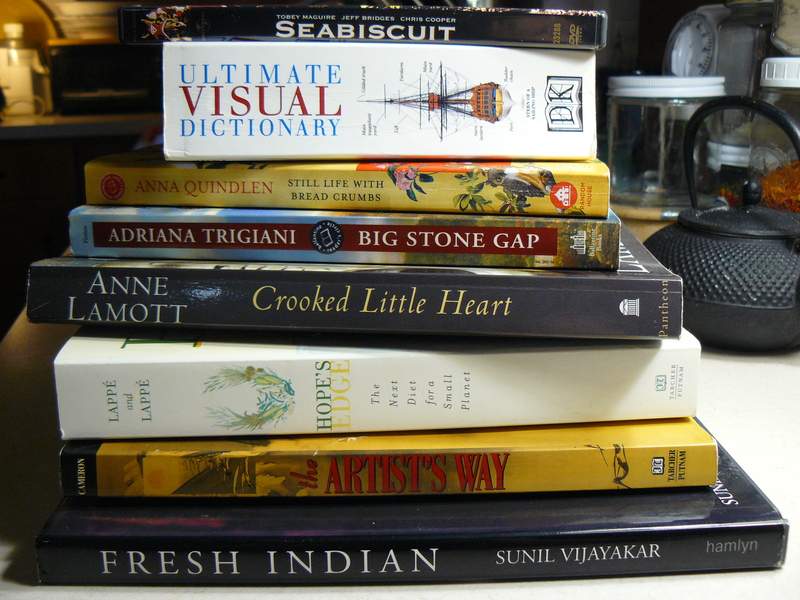 Most of the weekend was spent digesting the contents of the one cookbook in this stack now sitting on my kitchen counter, called “Fresh Indian” by Sunil Vijayakar. Delightful! Full of simple adaptations of traditional Indian dishes with all the requisite herbs and spices that distinguish this flavorful cuisine. All the while making a mental list of what I have and don’t have in my kitchen. Need to get some more turmeric. Have lots of cumin and coriander, check. Plenty of both ground and stick cinnamon, ground fennel and seed, check. Chili powder and flakes, largely unused over the years but present, check. Mustard seeds, check. Curry leaves and garam masala, must acquire and play with these two I have no experience with. No cardamom at all. And that’s what I became obsessed with. I love cardamom. I always keep ground cardamom in my stock of spices and love to add it as that secret something to certain baked goods. Now I was focused on the use of cardamom pods that most of these recipes called for and spent time with Google learning more about them. 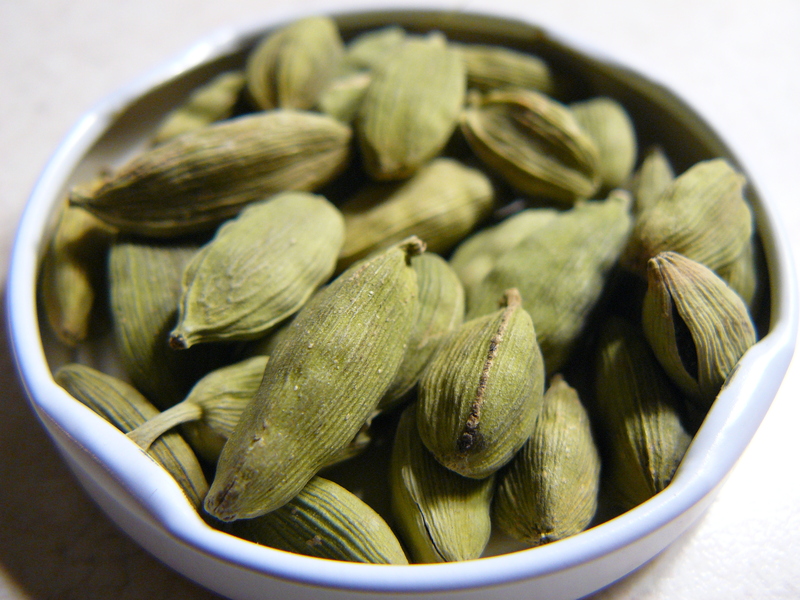 Cardamom is grown in just a few places in the world with the specific conditions it requires. It is considered one of the most valuable spices due to its rich aroma and therapeutic properties. The seeds of the plant contain a variety of important minerals such as calcium, sulfur, and phosphorus. They also contain a volatile oil composed of acetic and formic acids. This volatile oil, which makes up about five percent of the seed’s mass, has aromatic and medicinal properties, and it is what makes cardamom so valuable. Cardamom, and my fresh homemade ‘mother’s milk’ would become the core of my post cleanse meals. But first, I needed to get some of these glorious pods. Excited to be the first one in our local whole foods coop early Sunday morning, I arrived home with, amongst a small stock of fresh vegetables, a small bag of cardamom pods (they ARE indeed expensive! ), fresh mint and cilantro, a good size bag of ground turmeric, and a small jar of prepared galangal paste. Galangal is Thai form of ginger, something I typically crave when in Thai restaurants, and this particular jar radiated on the shelf when it saw me. Smile. I was ready for my first post cleanse day of full meals after eating broth and vegetables of the large pot of soup made to break the fast. Lunch became a small pot of this vegetable soup reheated with some brown rice, a few teaspoons of the galangal paste and some mother’s milk. Delicious! The flavors burst from this simple soup. I can’t remember the last time I used the word flavor. Distinctive to the use of a little bit of something special, I realize that all my months of much needed comfort food lacked this particular feature. 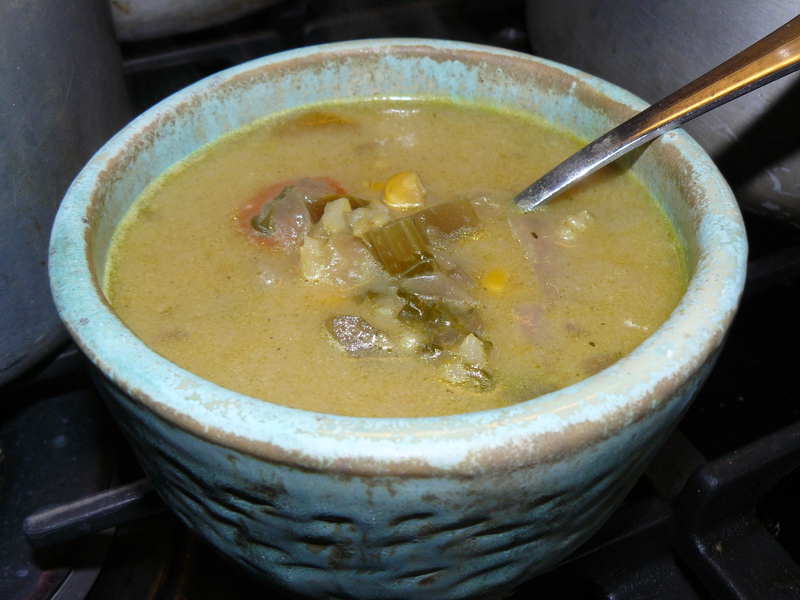 Comfort food after all, embodies the primary characteristics of blended, warm and consistent. Not at all like the bursts that one might associate with something unexpected and distinct. Black beans soaking in an adjacent pot for making some simple Brazilian style black beans for supper, Nora and I headed out for our afternoon romp in the woods. 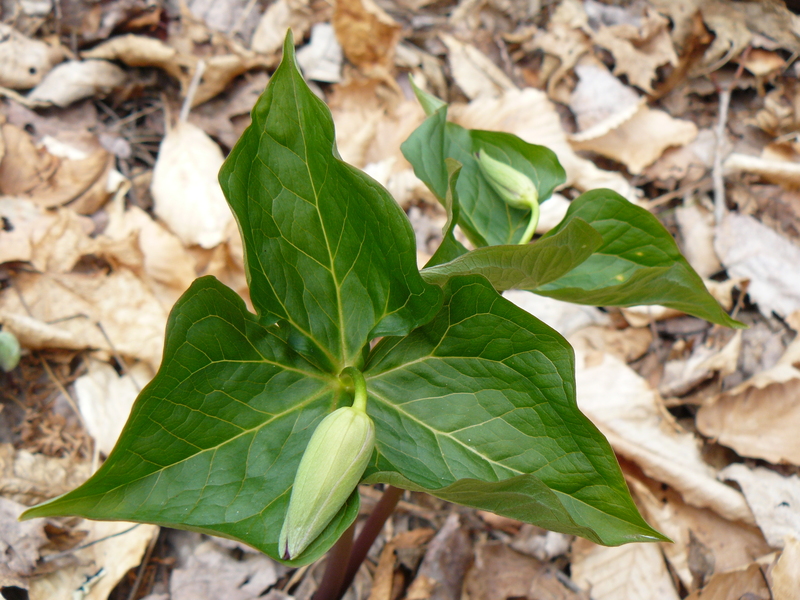 Walking slowly and scanning the surface for emerging shoots of all new things, I notice the burgeoning presence of precious trilliums and their promise of deep red burgundy just peeking out from the blossoms. 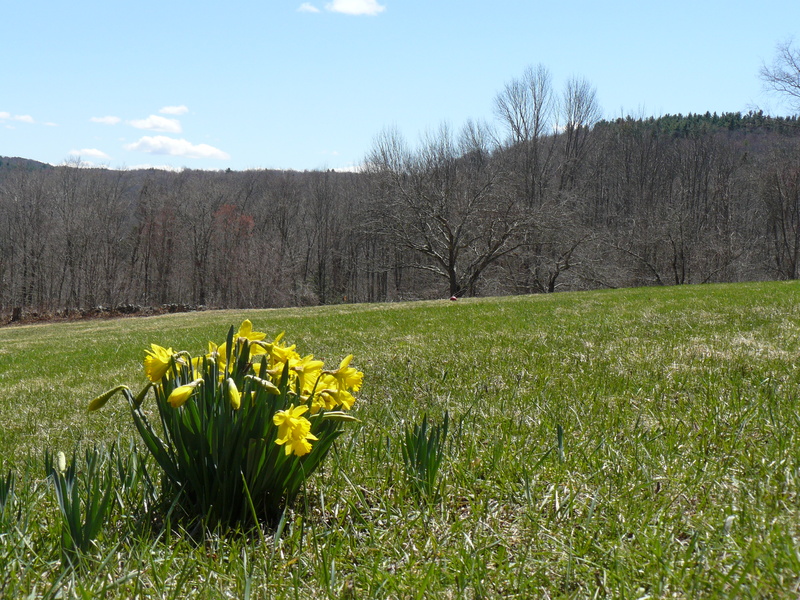 But most evident is how the floor of the woods is now exploding with the leaves of trout lilies everywhere. 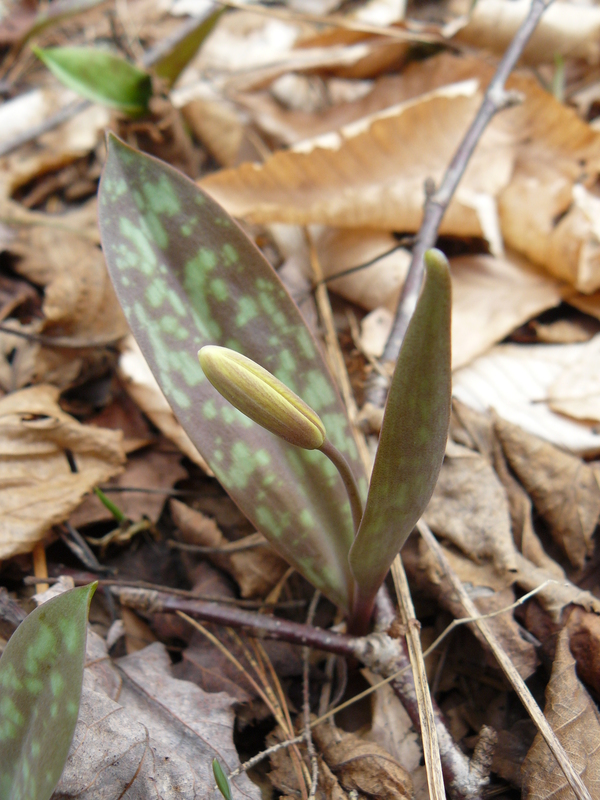 And then I see just one lone trout lily blossom with its delicate blossom hanging in wait for just the right moment to open and color the carpet of otherwise single leaves with its distinctive flavor. 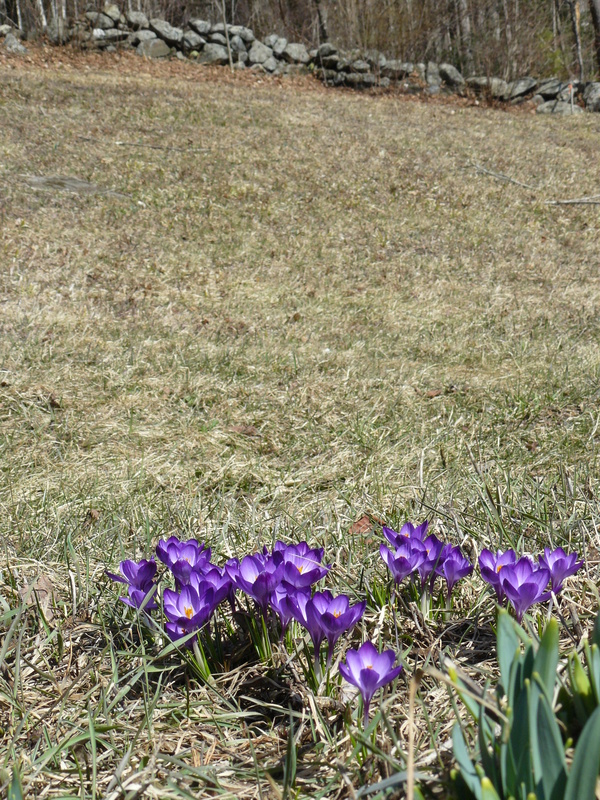 It is like the crocuses and daffodils that have emerged in the middle of the meadow. In the sea of vast rolling ground, these bursts of blossoms add unexpected flavor and focus to the view. A little bit goes a long way. 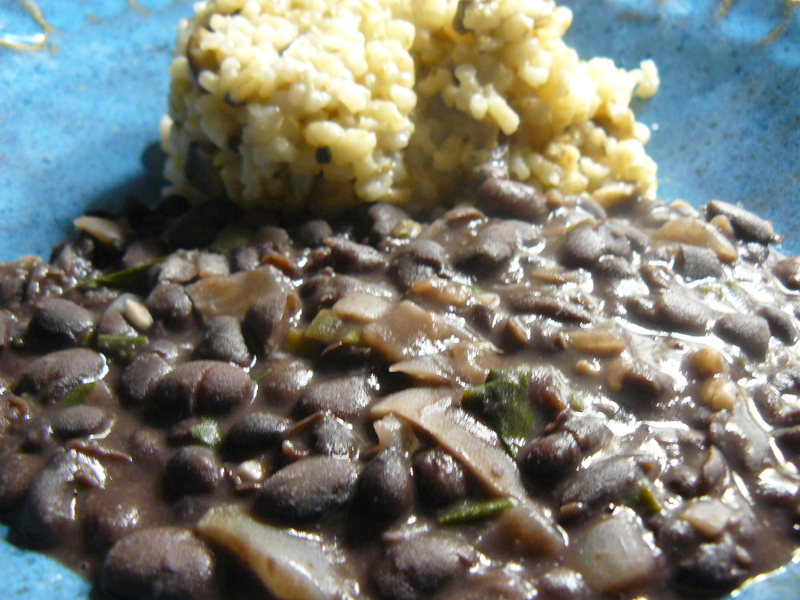 Preparation of the black beans is a satisfying affair of chopping onions and garlic, fresh scallions and parsley and allowing everything to simmer to a perfect amalgam. I grate just one large carrot and add to it four leaves of fresh mint torn to tiny pieces, fresh squeezed lemon, and set aside. Finally, the moment I have been waiting for, making a flavorful event of the already cooked brown rice. First, a few chopped mushrooms sautéed in just a hint of olive oil with three of the cardamom pods. Add a splash of mother’s milk and saute until mushrooms release their liquid and pods are soft. I push down on a pod with the back of the spoon and the many seeds release into the pan. Taste one. Kazam! It is a huge and intense burst. I realize too late after releasing all the seeds from the three pods that it will be way too much, that one would have sufficed for this single portion of rice I am preparing. I add about 3/4 cup of cooked rice and an equal amount of mother’s milk to the mushroom cardamom mixture, cook gently until liquid is gone and cover. It is a simple meal that requires slow and easy. One bite goes a long way. I nurse every forkful, feeling how little food I actually need to fill and be satisfied and how much the flavor mitigates quantity required to feel nourished. Hope’s Edge is about the politics of food. The consistent message offered from the authors’ exploration of cultures around the globe is that the scarcity of millions is controlled by just a few. It is a brilliant documentation of how hope for ending hunger might be found by embracing ‘living democracy.’ It is a simple concept that embodies the time honored question of “How do we discover our voices and use them to shape the larger world around us?” It is an inspiring text that gives context for considering all the life choices that have brought me to writing about something like flavor, while sharing a value as fundamental as food security with my community, and, how just one voice, amongst a world of voices, might truly make a difference.